When it comes to smartphone platforms, there’s plenty to enjoy on iOS and Android alike. The “iPhone vs. Android” debate is obviously a heated one among enthusiasts, but most people will acknowledge that both platforms have advantages and disadvantages compared to the other. Many pros and cons leave room for debate, of course, but one thing is certain when it comes to third-party development: Google’s Android platform gives app makers far more freedom to explore new functionality than Apple’s iOS software. We have written about great Android apps that do amazing things the iPhone cannot twice now in the past. In the first edition of this series, we wrote about Cover, Swype, Profile Scheduler, Android Stocks Tape Widget and Smart Launcher. Then, in the second edition we covered five more outstanding apps: Event Flow Calendar Widget, DashClock Widget, Aviate, Tasker and AirDroid. AirDroid, by the way, remains one of our favorite Android apps of all time. If you haven’t yet checked it out, you really should. Now we’re back with part 3 of this ongoing series, and we’ve got five more fantastic apps for Android users to check out if they’re looking to extend the capabilities of their handsets in ways that iPhone owners simply cannot. The curiously named Dodol Launcher is described by its creator Camp Mobile as an app for customizing the decor of your Android interface. In simple terms, Dodol lays the groundwork for users to apply any one of a huge number of custom themes to their Android phones. And we’re not just talking about simple wallpapers here, we’re talking about completely changing the look of your device with a new layout, new icon packs, new widgets and extended functionality. 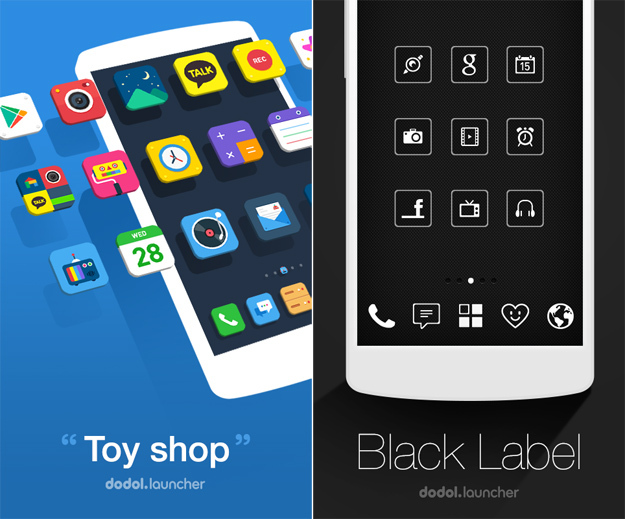 The app’s description states that “thousands” of high-quality themes are available to Dodol users, and they all include custom icon packs and unique graphics. Also included are various skins for Dodol’s special widgets, which include a memory cleaner, quick settings, a battery widget and a customizable wide settings widget for adjusting things like Wi-Fi, Bluetooth, ringer profile and more. “Your phone will become a piece of artwork itself with the totally new wallpapers and icons,” Camp Mobile says on the app’s settings page. Oh and before you ask, the Dodol theme pictured in the photo at the top of this post — which happens to be my personal favorite — is called “Dark Chic,” and it’s free. Dodol Launcher is free in the Google Play app store. It seems like there are a million mobile messaging services out there right now, and new ones pop up each day. There is one thing that most popular options do not do, however: Take standard SMS into account. Hello SMS serves two main purposes. First, it completely replaces your Android phone’s messaging application, funneling all of your standard SMS, MMS and group messages into an app with a gorgeous tab-based UI that might just be one of the most enjoyable mobile messaging interfaces we have seen so far. Beyond that, the app lumps in a typical data-based mobile messaging service that provides free unlimited international messaging to all users. There are plenty of great messaging apps out there for the iPhone, of course, but obviously none of them have the ability to also take over iOS’s in-built messaging app and replace it with a gorgeous new design. 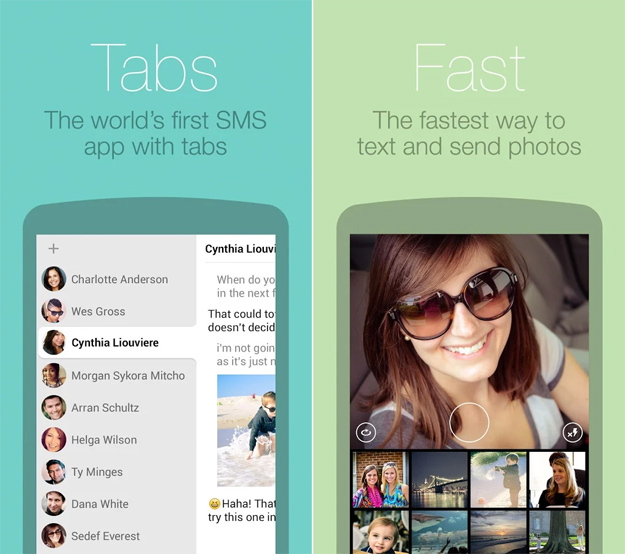 Hello SMS is available now as a free download in the Google Play store. Weather Underground? But… Weather Underground also makes an iPhone app! Indeed it does, but Weather Underground’s Android app is a perfect example of software that features terrific functionality on Android that its iOS counterpart simply cannot achieve. 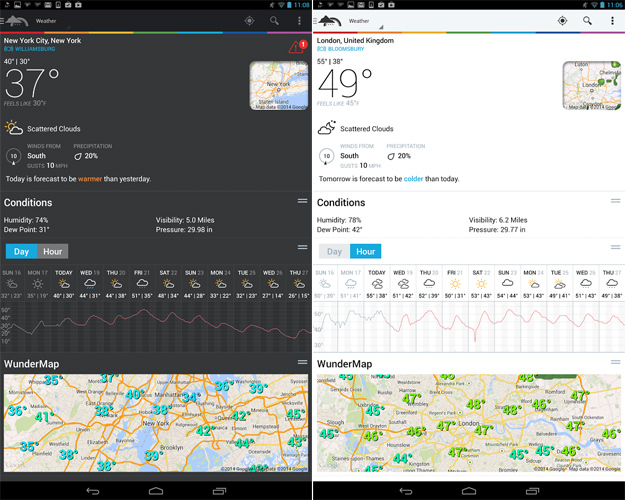 Beyond providing users with exhaustive current weather and forecast information, the Weather Underground app for Android does two awesome things that no iOS weather app in the App Store can do. First, it allows users to add one of several weather widgets to a home screen, providing detailed weather information that is updated on a configurable schedule. Want to always see the current weather conditions without taking up precious home screen real estate? Weather Underground’s app also allows Android users to display the current temperature in the notification bar along with an icon representing the current conditions. This way no matter what screen you’re on, you can always see the weather. Weather Underground is completely free and it can be downloaded from Google’s Play store. There are plenty of iPhone apps that can hide certain data such as photos and videos behind password protection, but what if you don’t want to deal with a brand new third-party app just to view hidden content? 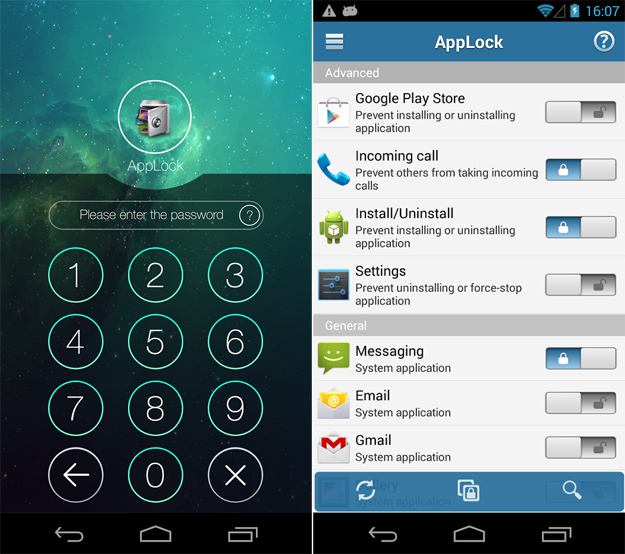 AppLock is a terrific Android utility that can protect a wide range of standard Android apps by requiring users to enter a password before accessing them. This password is in addition to the standard PIN or passcode people might use to secure their Android devices. By using AppLock, users gain a second layer of security to help ensure no one can access their private data. AppLock is a free download from the Play app store. Regardless of your opinion of The Pirate Bay and torrents in general, it’s hard to argue that blocking access to apps that deal with The Pirate Bay isn’t a characteristic of a closed ecosystem. While iPhone users may never be able to access apps like The Pirate Bay Browser in Apple’s App Store, Android users looking to access the popular site have plenty of options and this might be one of the best. The Pirate Bay Browser does exactly what you think it does: it provides people with access to The Pirate Bay, one of the most popular torrent directories on the planet. Users can see popular torrents along with associated details, and links can be opened in the bittorrent client of your choosing right from within the app. The Pirate Bay Browser is completely free in the Google Play store.